Full and student members will automatically be enrolled in a particular local branch of the society. 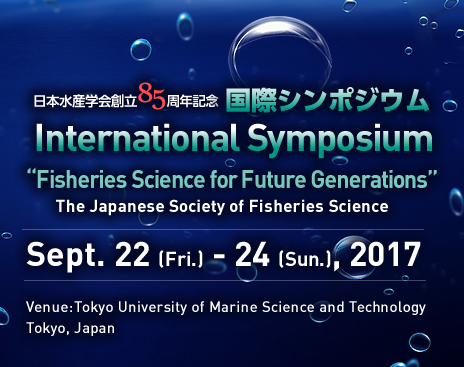 Members can receive full-access rights for on-line publication of both Fisheries Science (English) and Nippon Suisan Gakkaishi (Japanese) published six times per year respectively. Nippon Suisan Gakkaishi in print is also regularly delivered to your registered addresses. Full, Sustaining, Foreign and Student members have the opportunity to contribute to the Societyﾕs annual meetings by presenting their research work. Those who intend to become either full, foreign or student members are required to submit an application form. When admitted with the approval of the Board of Directors, members will receive all the aforementioned benefits. At the time of application the appropriate membership fees for the year concerned must be paid in advance. New members shall receive the official journal of the society starting from the first issue of the corresponding year. The members are directed to use their membership numbers in all correspondences with the numbers must be notified as soon as possible. Please remit the membership fees to the account (Postal transfer account number: 00100-1-59529, Account owner’s name: Nippon Suisan Gakkai (日本水産学会)). Be sure to write down your contact information (name, phone and e-mail address) in the space for correspondence. If student members wish to continue the membership, the fees for the following year must be paid in advance until the end of December. Please pay the membership fees in one of the following ways. International postal money orders are available at post offices in almost all countries. Some small post offices may not have the money orders. Applicants may send an international postal money order by themselves in the U.S. In other countries, however, the international postal money order is sent to our office directly by the post offices. In this case, please send the receipt along with the other application materials. If you cannot purchase in Japanese Yen, please purchase one in another currency such as US dollars at the day’s rate. Please notify promptly the Secretariat of the Society of any change in the information which is registered with this Society including journal mailing address and place of work after admission to the Society. If you wish to cancel your membership, please notify promptly the Secretariat of the Society to that effect. Except for student members, membership continues to be effective unless your intent to withdraw is conveyed to the Secretariat of the Society. Withdrawal is not allowed within the annual period. Intent to withdraw should be conveyed until not later than December of the year in which you wish to cancel your membership. Please note that a withdrawal notification made on or after January will result in withdrawal from membership only by the end of that year.